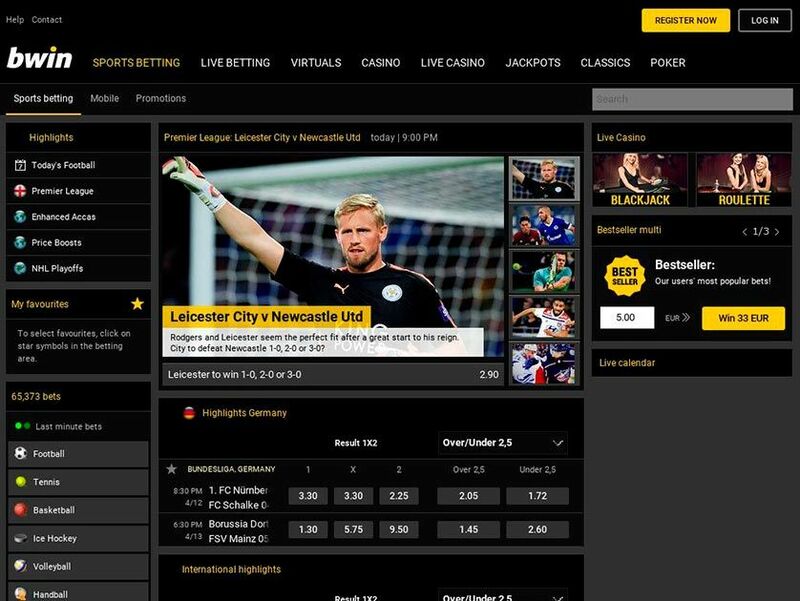 Bwin bookmaker is one of the biggest names in the online sports betting industry, with hundreds of thousands - if not millions - of sportsbook members. It’s easy to see why betting is so popular at Bwin though, as this is an online betting site offering it all, including a nice welcome offer, superb customer service, and a really good depositing and withdrawal process. Plus, of course, it offers loads of great sports for you to bet on, including a massive number of football betting opportunities. 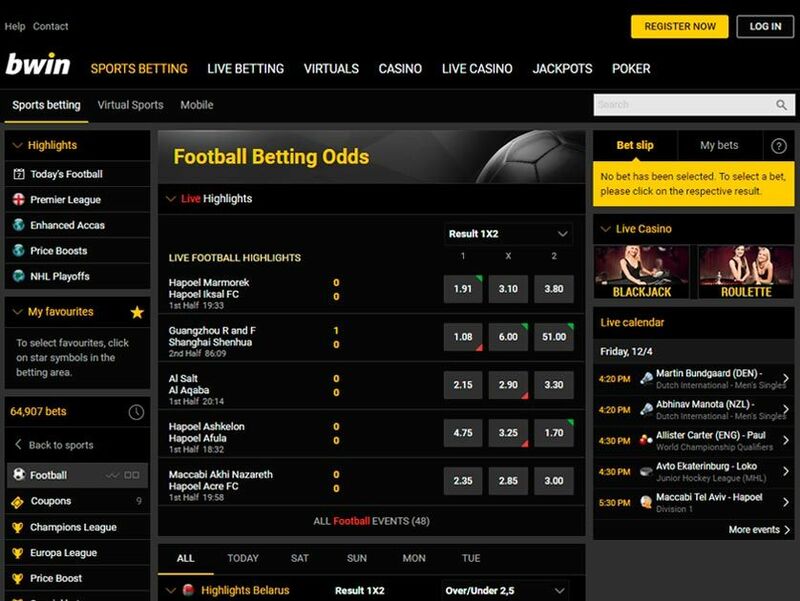 If you’re looking for a new online betting site, Bwin should be right at the top of your list. Bwin offers the chance to bet on a massive array of different sports, however this site is about football betting, so we’ll concentrate on that. Regardless of the league or cup you want to bet on, you’ll find that Bwin almost certainly offers it. What’s more, there are often promotions attached to different football betting markets, enhancing the odds and increasing the excitement you receive. Most will choose to make simple bets, such as on the result or the first goal scorer, however it is possible to get more in-depth at this site, thanks to the staggeringly large number of football betting markets. Bwin is an online bookmaker that also offers live sports betting, which is fantastic. This allows you to bet on the action as the game is in progress - something that only enhances your enjoyment. 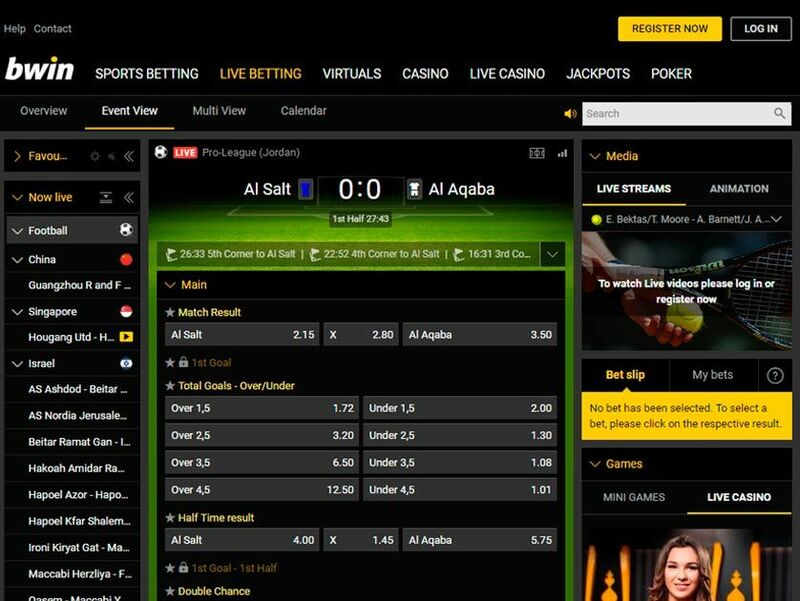 The live betting at Bwin is some of the most responsive you’ll find anywhere, with odds updating on a constant basis. Speaking of odds, you’ll find that they’re fair across the entire site, and often even manage to be better than those found at any of the other online bookmakers. Do you love to get a free bet when you sign up with a bookmaker? If so, you’ll love the Bwin sign-up offer, which gives you a free bet if your first bet is an unsuccessful one, providing that first bet was at odds of evens or greater. The maximum free bet you can receive from this welcome bonus is £10, so it’s not the largest new customer offer around, however it’s still one that should appeal to many betting fans. There are no bonus codes needed to activate this welcome offer, making it exceptionally easy to claim. At the time of writing, none of the other bonuses and promotions require bonus codes either. Experienced players will know that there will be some terms and conditions to the Bwin sign-up offer, and the biggest is the fact that the original bet must be 1/1 or higher. This is vital - fail to adhere to this and you’ll sacrifice your chance to get a free bet. You should also remember that those depositing using Skrill, Neteller and Entropay will not be eligible for this promotion. Also, your free bet must be used within seven days, or it will be removed from your account. Got a question or complaint? If so, you’ll need to contact the Bwin customer service team, who generally offer fast and useful answers. Unfortunately, there’s no way to make contact with them straightaway though, as there’s no live chat or phone support offered. This means that you’re forced to contact them using email - something that is quite slow, meaning you’ll have to wait for answers. This is obviously not great if you have an urgent issue! Check out the “Help” section if you’ve got a question before contacting customer service, as this is pretty comprehensive and provides answers to many common questions. The Bwin mobile app is an exceptionally good one, and it can be downloaded for free at The App Store or Google Play. Regardless of whether you’re using the Android app or the iOS app, you’ll find that it’s exceptionally easy to make bets, as the entire process has been optimised for mobile users. There are plenty of markets (in fact, there are exactly the same number as you’ll find at the desktop site), plus it is possible to deposit and withdraw using the app. If you’re not a fan of mobile apps, you’ll still be able to play at the Bwin sports betting site. Just use your mobile browser to access the bookmaker, and from there you’ll be able to bet as normal. So, whether you like iOS and Android apps, or whether you prefer using your browser, you’re completely covered when you use the Bwin mobile betting platform. Everyone will need to deposit at least once at this sports betting site, but how do you add funds? Well, there are absolutely loads of different options, including VISA, MasterCard, various e-wallets and prepaid cards. This means that everyone should find a way to deposit at this bookmakers site. Mobile players will also like the fact that Apple Pay can be used. There are no fees for depositing and deposits will hit your sports betting account instantly. But how fast is the withdrawal time? Well, like most sites, Bwin will take a couple of days to process your payout request, however once it has been processed, the money is released to you straightaway. In general, the average withdrawal time is around 48 hours. Fees are not charged for withdrawing, just as you’d expect from a top football betting site, and the minimum withdrawal amount is more than reasonable. We really can’t say enough good things about this fantastic online gambling site. Bwin sports betting customers will find a superb array of different sports for them to bet on, including a massive number of football betting markets, plus they’ll also find that the odds are more than fair. It doesn’t matter if you play using a desktop or a mobile device either, as both provide a fantastic playing experience. The Bwin online bookmaker really is one of the very best around! If Bwin sounds like the perfect site for you, why not head there today? You can then sign-up and claim the superb welcome bonus offered to all new customers.